Funny thing: I’ve been on a Howard Stern kick lately. Not a watch-the-show-online-religiously kind of kick. Rather, an oh-these-are-interesting-interviews-to-listen-to kind of deal. I’m now pretty much over it, as the kids would say. But, for a day or two, I would pull up the audio on YouTube from interviews featuring famous heavy-hitters such as … well … Mario Lopez (??) and Jonah Hill (?) while making dinner or tidying up around the apartment. Yeah, I know. I cringed, too. Ahh, but wait. There was one particularly fascinating segment that featured an extended chat with Jerry Seinfeld, seemingly taped before Stern’s season three episode of “Comedians In Cars Getting Coffee” occurred. In fact, at one point, the radio host can’t even get the show’s name right and a particularly icy Seinfeld corrects him without a shred of patience for nonsense. So, imagine my surprise, then, when I finally got around to pulling up season three’s finale, which starred Stern, last night to find … somewhat of a disappointingly short episode that sadly fell right in line with a few of the other duds that this latest season offered. And, yes: Just typing that sentence brought a tiny tear to my eye. – Louis C.K.’s season-opener was one of the best episodes the series has ever produced. Giving him more time than normal, heading out on a boat and even using oddly placed animation proved to be one of the freshest things “Comedians In Cars” has ever offered. Plus, as one may expect with anything C.K.-like, it was heart-on-sleave revealing at times. For as frustrating as some of the others ultimately were, this nearly made up for the season’s missteps. – While Jay Leno seems to be one of the most polarizing figures in all of mainstream entertainment, comedians continue to agree that his comedic chops are top-shelf. On the heels of his “Tonight Show” departure, his episode was easy and fun. Plus, it pulled back the curtain on the guy, which, outside of the occasional “60 Minutes” interview, has become somewhat rare after the whole Conan debacle. At the end of the day, the piece was surprisingly delightful. – I still love Tina Fey. 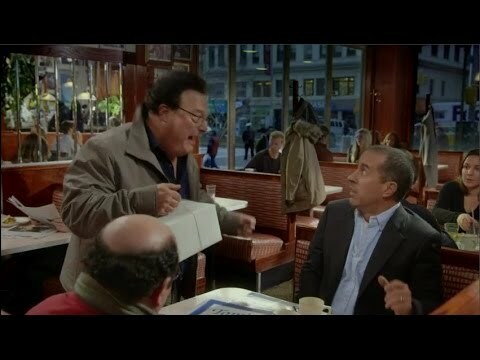 – And kudos to Jerry for dreaming up the “Seinfeld” bit. It wasn’t ideal, but it was a brilliant way to expose eyeballs to what he’s been doing online (you can’t get much bigger than the Super Bowl, you know). And, most importantly, it announced “Comedians” as a serious hobby for the guy. You don’t pony up for a half-time appearance, blow your lets-go-to-Tom’s-Diner card and allow the world to speculate about a “Seinfeld” movie if you aren’t trying to truly get this web series off the ground, three seasons into its run. – Never before in the “Comedians In Cars Getting Coffee” oeuvre has Seinfeld’s guests seemed so uninteresting. And never before in the “Comedians In Cars Getting Coffee” oeuvre has there been such a shoehorned-in desire to visit 49 places in one 12-minute episode. My point is this: The season spent an alarmingly tiny amount of time profiling the actual guests at hand. In fact, it often seemed like more of a platform to sell cars and publicize trendy eateries. You mean to tell me you spend an entire day with Tina Fey, going from a coffee place to a dessert place (and a stop in Harlem in between), and you could pull only 12 minutes of mostly bland banter? Wait … what?! It seemed as though each time a truly meaningful moment would be on the verge of revealing itself, the cameras would cut to more soft jazz and coffee beans. And, hold on. For as self-effacing and fascinatingly neurotic as Howard Stern is, you give three of 14 minutes to a “game” naming prices of products at a grocery store? Again: Wait … what?! What made the series so successful from the jump was the feeling that you actually got to see these people in real life circumstances, even if that was never the case. Watching two old pals — Jerry with Larry David — talk about what it was like to work with each other, that was fun. Allowing Alec Baldwin to meditate on why Seinfeld has been so successful and why “30 Rock” was one of his favorite jobs (while Fey’s episode offered a mere passing reference to the series), that was intriguing. Listening to Chris Rock explain why kids need to be bullied, that was actually funny. Shoot, even watching Ricky Gervais lose his mind while riding in the car with Jerry, that was entertaining. This latest crop of episodes, though … some are bland while others are entirely impossible to even watch. I mean, I love Patton Oswalt as much as the next guy, but allowing him to go on and on about the DeLorean as though there’s nothing else in the world he’s interested in? Come on, now. Give us a reflection on why “Young Adult” kind of sucked, or what went into nailing the role he took on in the surprisingly solid “Big Fan.” Stop cutting to more shots of Cronuts, for expresso’s sake, and ask Leno if he’s talked to Conan in the last five years. Bah. I already wrote about this issue back in November, so while I’m not putting the wet suit back on to tread in those complicated waters again, I will say this: As referenced before, Jerry Seinfeld is getting more and more defiant in his old(ish) age. Proof of that can be seen in both Stern interviews (the one on Stern’s show and even the one on “Comedians,” albeit it more vaguely). He seems to have no patience for this kind of talk and the more interviews he grants, the more ornery he appears. Which is odd, because, I mean, come on, now: This is Seinfeld! Do I think “he may come to regret being so flip,” like Rothman suggests in her piece? No. In fact, that’s absurd writing — at this stage in his game, why would he even give a second thought to possibly offending people? He has all the money and all the respect in the world. The word “regret” shouldn’t even be in his vocabulary. But do I believe there’s some credence to the notion that he might want to diversify his guest list? Well, as someone who has suggested after every season that he bring on more women, you can guess what my answer would be. The difference this year, however, is that for the first time in the series’ short history, it’s facing a bit of a crossroads: Either get back to being interesting or just fade away as nothing more than an advertising arm for Acura (which, by the way, was much more annoying than I previously thought it would be. Even Tina Fey looked genuinely confused when her host ironically began talking about where that episode’s product placement was going to appear). Suggestions? Julia Louis-Dreyfus is a must. Amy Poehler is a probability. I could see Chelsea Handler being roped into one of these. Maybe Amy Schumer, or Mindy Kaling or something. As for the other end, Keegan-Michael Key and Jordan Peele should be considered. J.B. Smoove is a name that could generate interest, and the Larry David connection is there. Tracy Morgan would be a whole load of fun. And, considering how captivating the reclusive Michael Richards season one finale was, why not try to see what Dave Chappelle is up to these days? See. The options are many. I know the series probably only came to be with help from a simple list of Seinfeld’s friends anyway, but now that we are in the position to stage a fourth season, it’s time to seriously consider the longevity of such a project and the type of success or impact it could truly have. Because watching Mel Brooks eat dinner on a tray and tell Old Hollywood stories is must-see TV. Shots of Todd Barry saying nothing in various settings in and around New York City? Everybody’s allowed a few air-balls, sure, but by the time season four is announced, there will be at least one eyebrow raised, waiting to see if that field goal percentage can bounce back after a few below-average playoff performances. Here’s hoping this thing isn’t eventually relegated to the bench. So much media. So little time. Do you have a Comcast subscription? If so, you might want to read this.